Since the demise of Lehman Brothers in September 2008 and ensuing great financial crisis (GFC), it would seem rather obscenely that central bankers and monetary policy has been obsessed with “deflation”, rather than remedying the actual causes of the crisis itself. Is this a fair analysis? Central bankers and policy makers were obsessed not so much with deflation but with transferring the losses of financial institutions onto the shoulders of citizens. When this transfer produced deflationary forces only then did they enter into QE territory in an attempt to stem them. Since then they have been trying to contain deflation without doing anything that might restore a modicum of bargaining power to labour or income to the dispossessed. Given collapsing oil prices, an emerging car loan subprime crisis brewing in the USA, slow down in China, continued economic woes in Japan and fears over Greece igniting another round of sovereign debt crisis in the EU, is it fair to say we may be entering a perfect storm again and a repeat of events similar to those in the GFC? Turning to the EU and euro zone itself, would it be prudent for the European Commission and ECB to countenance the rapid introduction of a two-tier Euro, specifically a “hard” Euro zone with Federal Germany at its helm, and a “soft” Euro Zone with France at its helm? If Europe continues the way it is now going, there will be no soft and hard euro. The euro will disintegrate, the result being a Deutsch mark zone east of the Rhine and north of the Alps and an assortment of national currencies everywhere else. The former zone will be gripped by deflation and the latter by stagflation. With reference to the second question, together with your reply, is it correct, as many allude, that the economic and social ramifications of the 2008 GFC are greater in many G20 nations today than conditions during the Great Depression in the 1930’s? It is not useful to make such comparisons. While it is true that the crisis transmission mechanisms are more poignant now than then, let us not forget that 1929 set in train the process leading to the carnage of the 2nd World War: hardly a minor repercussion. Back to Europe and the development of a nascent banking union within the EU members states. Do you believe it wise of political and economic policymakers to concentrate on a “banking union” when centrifugal forces within the EU are growing, rather than dissipating presently? A banking union would be a godsend. It would break up the death embrace between insolvent banks and insolvent states. Alas, we created a banking union in name so as to ensure it never happens in practice. And so the said death embrace continues. The recent US unemployment figures (December 2014) and third quarter 2014 GDP growth figure of 5% seems a little unbelievable, particularly given most statistical analysis that demonstrates all gains and more since the “supposed” US recovery have accumulated within the top 5% at the expense of the average Joe on Main Street? If you look at the US labour market closely you find that the number of Americans wanting a full time job and not having it has remained more or less constant over the last few years. Employment growth has not kept up with labour supply which, in the United States, rises faster than in Europe. As for income growth, it is no great wonder that, courtesy of low investment and QE, asset price increases and share buybacks boost the top 1%’s income further while wages are languishing on a filthy floor. And so macrodata prosper while most people suffer. Since late 2014, and continuing during the first weeks of 2015, we have Cassandra’s warning about a Greek exit from the Euro Zone should left of centre political parties gain power in January’s election. Is this view overstated and fear mongering no less? It is pure fear mongering for the purposes of dissuading Greek voters from voting for SYRIZA. It is that cynical. The powers that be know that Grexit would unleash destructive powers that they cannot control. So they are bluffing, hoping that Greeks will fall for this piece of terror a second time – after 2012. It looks as if they cannot fool the Greek voters twice. An economically prosperous EU would seem essential for the wellbeing of the global economy, given this assumption, what exactly are EU policymakers and the constituent member national governments thinking about by hailing austerity as a panacea, rather than a massive fiscal expansion similar in impact to Marshal Aid nearly 70 years ago? A new Bretton Woods agreement and re-imposition of capital controls would seem more beneficial, rather than all the supposed “free trade” malarkey we keep hearing about from both sides of the Atlantic. Would you agree? Capital controls have even been adopted, of recent, by the IMF as essential shock absorbers and stabilisers. A new Bretton Woods would need to configure what I call a global surplus recycling mechanism that prevents bubble-creating financial flows during the ‘good’ times and limits the extent to which the burden of adjustment falls on the shoulders of weaker nations and citizens during the ‘bad’ times. Politically, the trouble is that, unlike in 1944, today there exists no equivalent to the United States then to convene such a conference and underpin the resulting agreement. Only the G20 can do this collectively. But with Europe in a state of comic idiocy and with the United States ungovernable, the prospects are dim. Concise and to the point replies with an astounding depth of knowledge behind them….for someone who has been following Y.V’s comments and accurate predictions over a number of years,and as Greek,I am delighted that he will play a decision making/taking role in the politicoeconomic life of the country. Well said. And I hope your readers know ” that every rise in Fascism bears witness to a failed revolution.” Now, this speaks more about the recent failures of Left, so I pray that the Greek people understand that if Syriza wins and fails, the prospects may be grim. In my humble opinion, this is our last chance at autonomy, so let’s put all our differences aside and merge our wills for a united, progressive, autonomous and prosperous nation of Greeks. 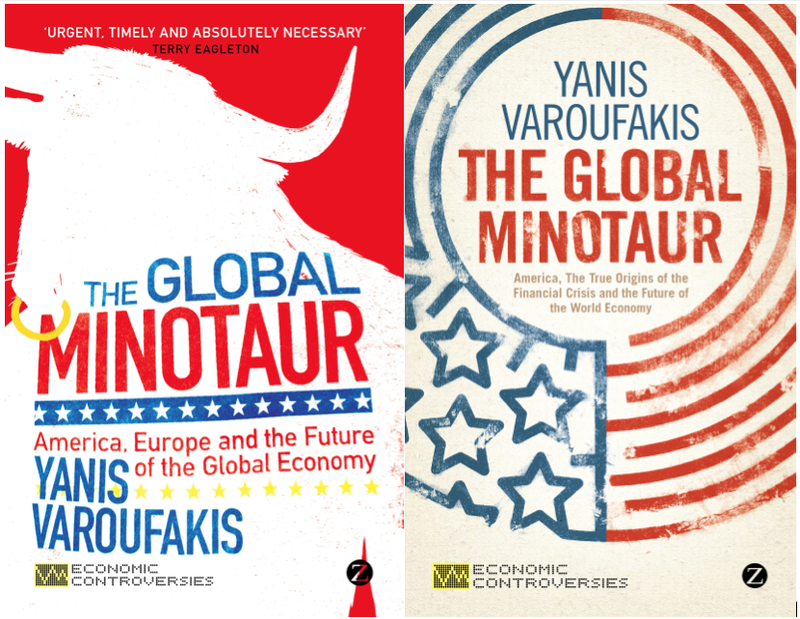 Yanis I’m extremely pleased that that you have joined the political inferno in Greece. I have followed you since your first “Modest Proposal” and particularly appreciated your finding a solution within existing regulations and your open acceptance of criticism and finding solutions. A practical realistic economist is (extremely) hard to find these days. Fortunately the Univerity of Missoury Kansas City and a few others offer alternative options (mostly good), however the MSM hardly report these possibilities, including your’s. I feel (personally) that the new Turkish gas pipeline to the borders of Greece offer a golden opportunity, $400mln in annual transit fees will sure come in handy for Greece. Clearly the EU will do everything possble to prevent Syriza from heading a new Greek parliament, especially if it decides to support a gas pipeline from Russia. I believe that Greece (Syriza) should now aqlready be planning a gas pipeline to Abania, whence a short undersea pipeline could supply Italy, all this surreptitiously “beneath the radar” and only be exposed shortly before the elections on 25th January. I may be wrong but I strongly believe that China, Russia, or a combination of the two wil be prepared to build that pipeline super fast. In short get into immediate disscussions with Russia and China for gas supply to Europe, for China it represents an opportunity to present itself via the Silk Road as an equal opportunity nation by providing cheap imports and at the same time providing growth opportunities by means of reaonably priced energy. Russia in the meantime has provided the EU with cheap energy for the last 40 years, reliably with exeption of 2006 and 2009. both short lived due to Ukraine siphoning off EU gas supplies.In coclussion, Greece make use of this golden oppotunity, besides the potential $400mln transfer fees of gas to the EU ther is the very real job potential of building the gas pipeline. Thanks for posting this – came as a nice surprise, only wished my questions were a little more thoughtful, but deadlines are deadlines and both of us are on tight schedules. My fingers are “crossed” that you will do well in the election – it will be nice to know an actual Greek politician in the home of democracy, namely Athens.